The intriguing search for the true identity of a 1930s cult novelist (published here, by Random, in 1971) whose obscure working life was based entirely on escapist subterfuge. Readers who wonder why they would want to follow Reiss through a convoluted trek in the footsteps of one Kurban Said (also writing as Essad Bey), author of the still celebrated 1937 romance (published here, by Random, in 1971) entitled Ali and Nino—star-crossed lovers embracing across the gulf between Islam and Christianity—need only take a step or two into the setup. After an introductory blind alley in which a German baroness is falsely identified to Reiss as the real author of Said’s works, he gives us turn-of-the century Baku on the Caspian Sea, where petroleum leaks out of the ground in profusion and Russia’s soon-to-be oil millionaires are arriving daily along with the same camel caravans that have passed this way for a thousand years. There, Reiss’s account of the real Kurban Said begins with the 1905 birth of one Lev Nussimbaum to the Jewish oil Minister of Baku and his wife, a woman from an obscure Russian village who harbors Revolutionary tendencies. Comes the Revolution, the comfortable haut capitaliste milieu of Baku implodes around the teenaged Nussimbaum and, as usual, when things turned bad for Russians they turned worse for Jews. Skipping forward, one finds Lev ensconced in a seething Germany, hobnobbing with nascent Nazis as a self-vested Muslim prince, author, and Orientalist—one steeped in the mysteries and cultures of Asia Minor, the Levant, etc.—known as Kurban Said. Further, his pose incorporates denial of his mother’s Jewishness, making her a Russian noblewoman (false) who sold her diamonds to finance Stalin’s—then Josef Dugashvili—rise to power (probably true) and committed suicide by drinking acid. Nussimbaum eventually married an heiress who never knew his real identity; he died tragically in Mussolini’s Italy. 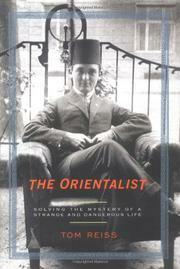 Marvelously written, and imbued with scholarly thinking on a forgotten tradition of Jewish-Islamic accord.